Security systems are designed for detecting the intrusion and unauthorized entry into the residential houses, commercial buildings, industries, and military surroundings. In our day-to-day life, security systems for home is a major concern to protect from burglary, property, and self defense from intruders. Generally, security systems for home can be designed using different technologies. Alarm security systems for home, alarm security system integrated with closed-circuit television surveillance, and so on. Different types of security systems for home can be designed using different types of sensors such as motion sensors, sound sensors, vibration sensors, and so on. Basically, security systems for home are designed using maximum number of sensors for the detection of intruders. Door knock vibration alarm home security system project is designed using an electrical transducer. The electrical transducer that converts vibration or pressure energy into electrical energy is called as piezoelectric transducer or piezoelectric sensor. 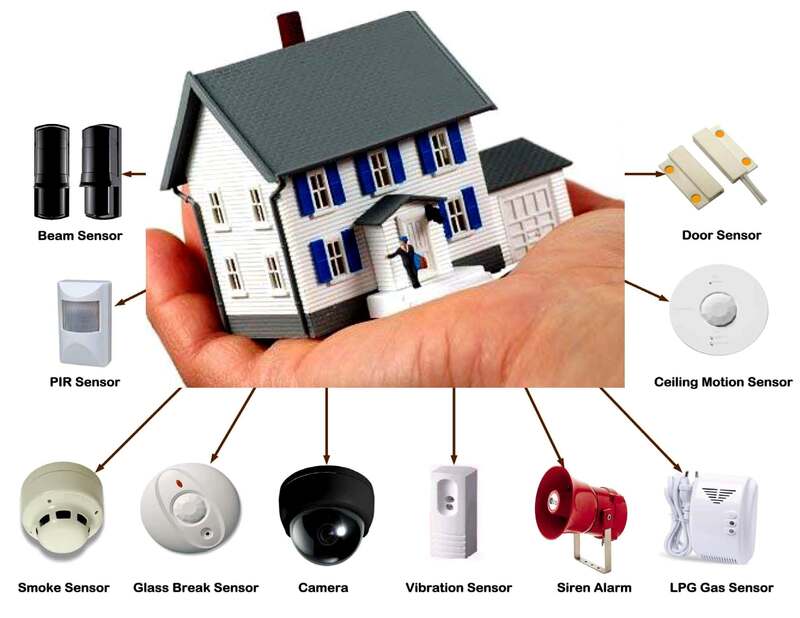 The major parts of the home security system project with vibration alarm are piezoelectric sensor, transistors, diodes, IC 555 timer, buzzer or speaker or alarm, and other basic electrical and electronics components. The security systems for home using door knock vibration alarm circuit is connected as shown in the figure. The piezoelectric sensor is connected to the door using an adhesive. The sensor and the security system project circuit are connected using a wire. The major components used in the home security system project circuit are vibration sensor, 555 timer IC, transistors BC548, BC549, and BC557, diode 1N4148, LED, and other basic electrical and electronics components such as resistors and capacitors. To understand the working of the circuit, we must know about the components used for designing security systems for home using door knock vibration alarm. 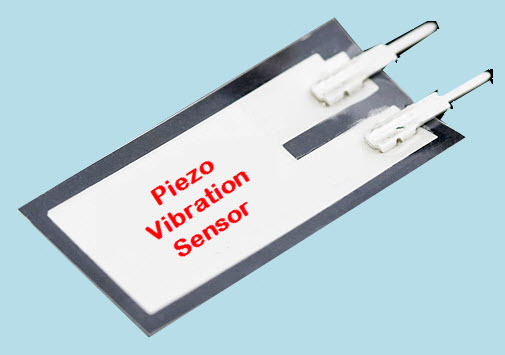 Piezoelectric sensor is basically called as piezoelectric transducer as it generates an electrical signal based on the measured input quantities such as vibration, flex, touch, knock, shock. Thus, whenever the piezoelectric film is subjected to vibrations (back and forth movement of piezoelectric film) causes the generation of low AC signal with high voltage (up to +/– 90V). If the door is knocked, the vibrations caused due to the knock produces mechanical energy. This mechanical energy is fed to the piezoelectric vibration sensor. This piezoelectric vibration sensor converts the mechanical energy into an electrical signal, which is further used in the circuit diagram of security systems for home, for activating the security alarm system or vibration alarm. 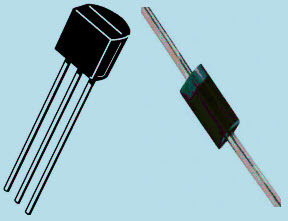 In general, the transistor is a three terminal electronic semiconductor device used for controlling electric current in the circuit. The base terminal is used to activate the transistor, collector terminal is used as positive lead, emitter terminal as negative lead. In this circuit, the transistors Q1-BC549, Q2-BC548, Q3-BC58 are connected as common emitter amplifiers and are used for amplifying the signal generated by the vibration sensor. Again, the transistors Q4-BC548, Q5-BC58, and Q6-557 are used for amplifying the signal (received after the rectified by the diode D1 1N4148). 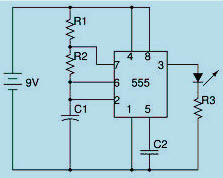 IC555 timer is an integrated circuit used as a timer, multivibrator, pulse generator, oscillator, and so on. Here, in this circuit IC 555 timer is connected in astable operation mode in which its operation is controlled using resistors and capacitors. Thus, in the security systems for home project circuit, whenever Q6 transistor turns on, IC555 timer is activated and thus an an alarm tone is generated in the speaker. The piezoelectric sensor is used in the circuit for sensing the vibrations that are generated due to the knock made on the door. Fundamentally, the signal from the piezoelectric sensor is amplified and processed by the circuit elements such as transistors wired to form common-emitter amplifiers and other components. The mechanical energy produced due to the vibrations caused by door knock is converted into electrical energy. The diode D1 is used for rectification of this signal and amplified using transistors Q4-Q6. Then, the output signal from collector pin of Q6 transistor is fed to the reset pin (pin 4) of the IC 555 timer. The 555 timer used in this circuit is wired as an astable multivibrator. If transistor Q6 turns on, then its collector goes high, activating IC1, thus an alarm tone is produced in the speaker. This alarm can be turned off after a few seconds (here 10s) of ceasing the knocks. The time taken by 22 mircoFarad capacitor to discharge that is connected to the emitter of Q4 transistor is equal to the time after which alarm automatically turns off. In the Q6 transistor’s collector circuit a 470 ohm resistor is connected and adjusted for ensuring the off state of IC1 whenever no perceptible knock is present. In general, the suitable value of this resistor is in the range of 220 ohms to 680 ohms. Do you know other security systems for home, which are practically being used in real time? Then post your ideas regarding the advanced security systems for home and improve the knowledge of other readers. and even GPS devices out there. You can use a free of charge telephone tracker app but they are really effortless to detect and do not do close to as very much as this app does.